My goal here is to compose a portfolio in a simple way using filters and spending a minimum of time. This is my demo portfolio. This filter is based on D-score and RS. D-Score Current: 70 - Max. Risk Stability Score: 7.5 - Max. Investors Currently: 10 - Max. The D-Score and the RS seem to me a good way to judge the rigor and the regularity of the darwins. These are qualities that seem essential to me. But on the other hand, not having good score on these criteria does not necessarily mean that a Darwin does not have these qualities. This filter is therefore intended to try to find quality darwins in another way..
D-Score Current: 55 - 70. Risk Stability Score: 6.5 - Max. Risk Adjustment Score: 10 - Max. 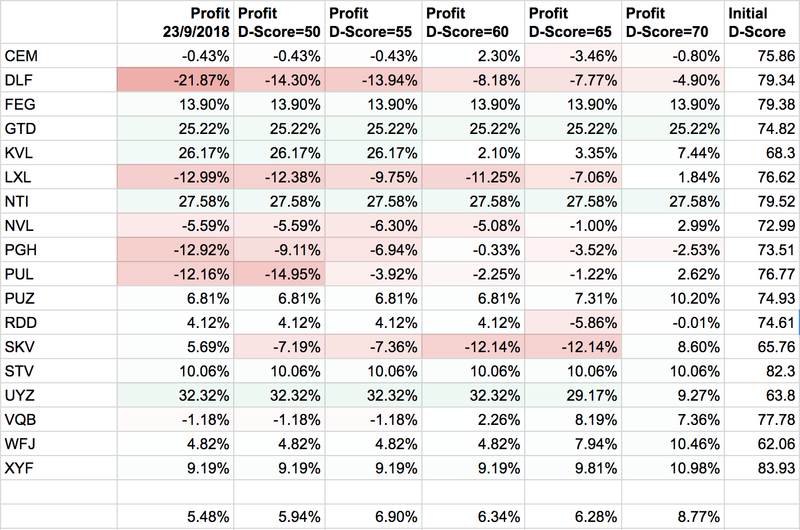 Loss Aversion Score: 6.5 - Max. Performance Score: 6 - Max. In both filters, the minimum number of investors is set to 10 in order to avoid investing on darwins that have just been imported. At the beginning of each month, I sell all the darwins. Then I buy all those who are part of one of these filters and whose divergence does not exceed -0.5%. Next I eliminate all those who have a correlation greater than 80 by keeping the one with the highest D-score. After that, I balance the investment by sharing the capital of the portfolio equally. It only takes me 5 minutes by month. This portfolio is voluntary simplistic, there are many ways to improve but this is not the goal. It is not an investment recommendation, but a simple experiment. I think there is now enough Darwin of quality to get a positive return on the year with a portfolio of this type. In any case, that is what we will see. Very nice! Glad to be in ! No, the selected darwins are part of one or other of the 2 filters. I feel that LA's rating is useless for judging my strategies. On the other hand, I am aware that it may be important for other types of strategy. That's why I use 2 filters. Considering n. of investors is an interesting concept. It is a way to maesure trust, I am using trader's equity. A minumum equity and investors is requred, if the darwin is not a forward test you trust it with your money and you can convince at least some friends to invest it. 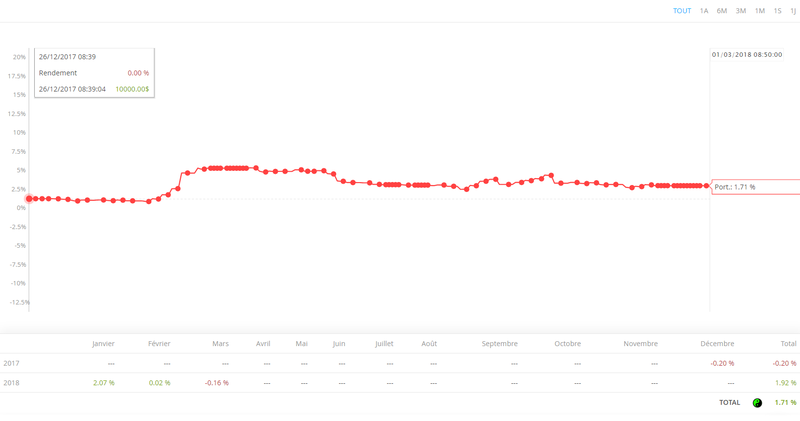 An Excellent Algorithmic-Trader and also Investor @Pulse07 , good luck with your Portfolio! Here are the darwins for March. 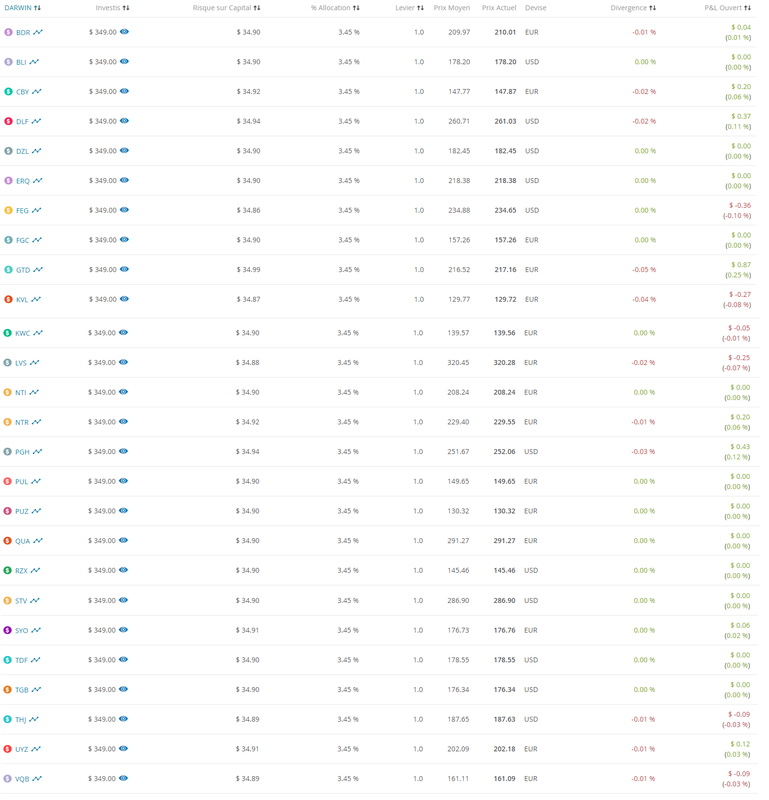 I changed the way of managing this portfolio because to sell everything and buy everything every month was too expensive. From now on, 2.5% of the portfolio is invested on each Darwin in 50 euros increments. There is 250 euros invested by darwin currently. The next step will be 300 euros when the portfolio will exceed 12,000 euros. Each month, I only sell the darwins that are no longer in the filters and I buy those who enter. If the available capital is not enough to buy all the darwins that appear in the filter, only the darwins with the highest D-score will be bought. Portfolio darwins that exceed the -0.5% divergence will not be sold until there is a "divergence" filter. But no Darwin exceeding this limit will be bought. It would take too long to pass each Darwin one by one to see if the divergence is exceeded. I hope a filter will be available soon for that. The purpose of this portfolio is to try to achieve a good return with a minimum of time spent. This portfolio is now composed of the contents of 4 filters. Number of trades Last month: 1 - Max. D-Score Current: 55 - Max. Return / Drawdown ratio Last Year: 1 - Max. Return / Drawdown ratio Last Year: 0.5 - Max. Filter 4 aims to avoid reselling too early. Pf's rating seems far too volatile and has a far too strong influence on the calculation of D-score. If we only rely on the D-score, we would buy too often high to sell low. IMHO, the D-score should be a buy and sell indicator and not, as is currently the case, an indicator of the darwins that perform well at the moment. For this it would greatly reduce the influence of the Pf on the D-score and focus at a maximum on everything that demonstrates the quality of Darwin and its trader regardless of performance. D-score 78.66 and Pf 9.37. D-score 54 and Pf 3.68. PUL after a 13% drawdown goes from one of the highest rated darwins to a just average darwin. Yet PUL has not changed, it was not better before the drawdown than after the drawdown. I have not really studied the new D-score but my first impression is that I am not convinced. It seems that this improved the rating of many quality Darwin which is a very good thing. But It seem that it has also improved the D-score of darwins significantly worse. As a result, the difference between the best and the worst does not seem to have changed much, which puts into perspective the interest of this modification. It seem that most Darwins with a good La rating have increased their D-score. Those with a low La rating have stayed at the same level or are a little lost. But I insist that what I just said is perhaps wrong because I did not take the time to analize it correctly. Other than that, I'm still waiting for a filter for the divergence. A filter to avoid the darwins that have been migrated too recently would help me too. I added "divergence> -0.5" and "days on darwinex> 180" to the 4 filters. Now I do not take into account the correlation because it's too long to check and I do not think it's very important on a portfolio of 39 darwins. Sorry to update the tracking of this portfolio so late, I am very busy right now. Filter 4 has been modified. The month of July has been difficult for many darwins. The correlation of darwins was problematic. 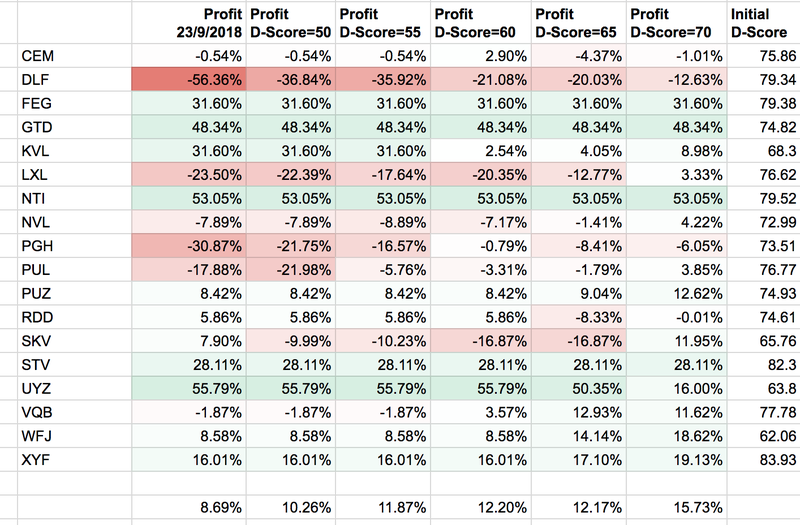 The portfolio contained five highly correlated darwins from the same provider, which has a big impact on the July results. But I will not filter the darwins according to the correlation until there is a better tool for that. One of the goals I've set for this portfolio is to manage it passively. I do not want to spend more than 10 minutes a month to update it. There would be a lot of things to improve on this portfolio, but I do not have time to take care of it at the moment. But it will still be interesting to see how it behaves with the current criteria. IMO if you want a quick fix for this, the solution is to have max one darwin per provider. Yes, but imho having several darwins from the same provider it's not a problem if they are not too correlated and they do not represent too much of the portfolio. I prefer to continue like this while waiting to be able to easily filter the correlation. The problem is now temporarily solved because only one dawin of this provider remained in the filters. 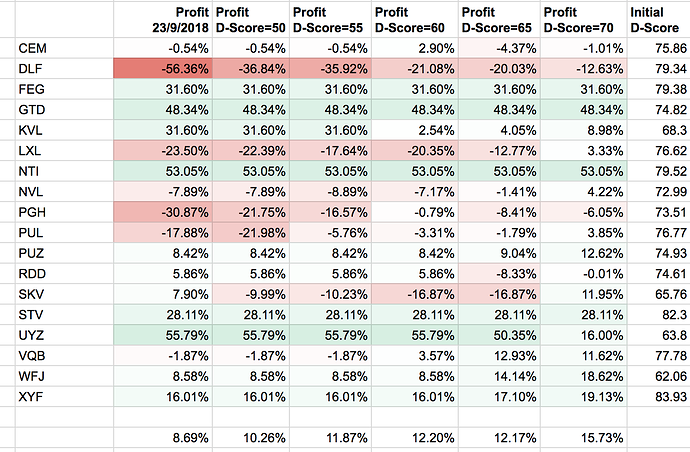 Except ERQ (divergence too big), I took your initial portfolio and check what would happen if it would have been Buy&Hold since 2/1/2018, until today, or if the darwins would have been sold when they arrive to different D-Scores. As @purple stated, the numbers are not entirely correct, and @CavaliereVerde explained that I could just use zoom to get them correctly. But I already had the calculations almost done and I didn't want to do them again Also, the point here is not the exact amounts, but analyzing if D-Score could be the main trigger to sell a darwin. 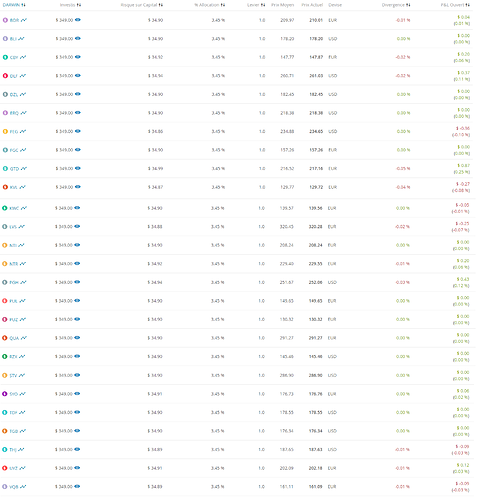 So, after doing this with multiple portfolios, and although there are always exceptions, I think that selling every darwin that goes below 70, seems good to get better returns than lots of darwins trading. A different problem would be to analyze when to enter again. 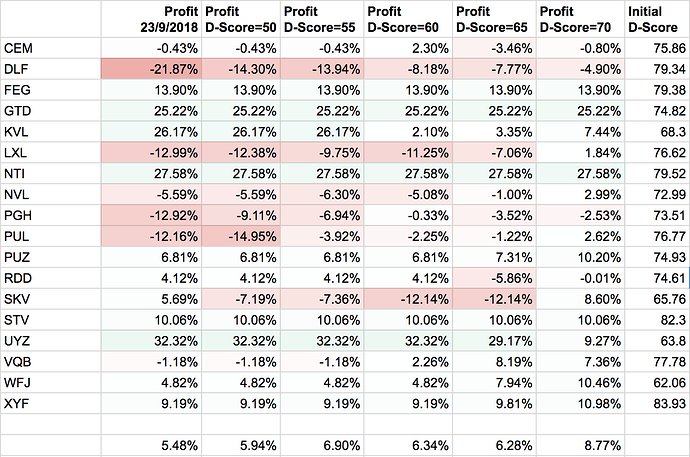 Using D-Score<70 as exit we're getting 15.73% return; if we add divergence and those math issues, probably we'd get something like a 11-13% YTD return (without leverage). EDIT: Please check a couple of messages below to see the correct table, this one is incorrect. I keep this one here just for historical purposes to avoid someone else makes my mistake! Much respekt for your great work @NemesisCraze but you should use correct formula for the futere to get a more valid result. Right formula: 1 / 127,32 * 158,92 - 1 = 0,248 = 24,8% (correct result). @purple thanks a lot!!! I changed the formula and indeed the results are very different! I'll update the other tables later today. So to sell a darwin with D-Score wents below 70 should really work well. Most darwins will have lost more after DS went down. KVL 152%? I would be very happy but I think there is something wrong. I suggest you to double check everithing above +60% or below -60% . Yep, I'll double check later (no time now), sure, I want the calculations correct. I'll post also the table so you can watch also if I did some unwanted mistake.